The product source contains only a very limited description about this product, that it is used to treat menopause symptoms and comes in 60 tablet containers. The product source contains no other information about product ingredients beyond what is listed above. The product source contains no information about product dosage. $21.49 for a 60 tablet bottle. The product source contains no information about product guarantees or return policies but does include a contact phone number for more information. Any one seeking to buy this product should contact the vendor before purchase for more information than what is provided in the product source about this product including recommended daily dosage and ingredients. 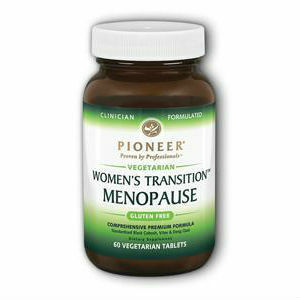 Jackie Horowitz	reviewed Pioneer Women's Transition Menopause	on July 26th	 and gave it a rating of 2.